The last two mornings, I’ve arisen before sunrise, I shuffled out into the chill, damp air and seen the most amazing sight in front of our garage: a pig…. 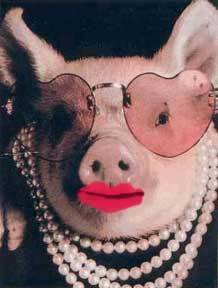 I have heard about pigs with lipstick; read about pigs with lipstick but until this morning had never seen a pig with lipstick. In our neck of the woods, this pig even has a name: It’s called the San Francisco Chronicle. The Chronicle unveiled a partly glossy newspaper Monday (section leads were glossy; the rest of the publication newsprint). It’s partly the voice of the west’s strategy to raise the quality of its print publication to maintain viability; to improve the “reading experience.” That reading experience in the past four years has seen circulation fall at a rate as fast as any major metropolitan daily in the country. But it also reveals Hearst Corp.’s subconscious (or maybe privately conscious) understanding that within a year, they Chronicle (and many other dailies in the country) will no longer publish seven days a week. Friday-Saturday-Sunday will be the new daily and it’ll be profitable. So at that point they will have needed to have morphed closer (physically) to what magazines associate with less-than-daily frequency, which is to say a glossy magazine. The glossification of the Chronicle is the latest in 30 years of newspaper “innovation” that has gotten the industry… nowhere. Color photos and color printing: Complete waste of time, unless you were selling new color-equipped printing machines (Gannett). Color photos look great in National Geographic. They look like crap in the New York Times. “Reader-friendly” stories. The pinheadification of story presentation has driven high-value readers to the Economist and other outlets, more recently highly focused Web sites. Virtually everything newspapers have tried in the past four decades has been a reaction to a financial issue (advertisers will love color!) rather than a genuine improvement for readers (hey, where were those weapons of mass destruction?). It is no coincidence that the rise of the conglomerate-congealed media, newsprint window-dressing and reader focus groups coincided with the demise of investigative journalism. It was cause and effect. With the glossification of its pages, the San Francisco Chronicle has completed its slow, agonizing self-emasculation. You would think that the editors who remain–who live literally at ground zero of the Web revolution, that is to say South of Market, San Francisco, Calif.–would feel the pain and get with the program. Yet they publish the newspaper with the same playbook that has been employed for 100 years. Why, with a shrunk staff, does the newspaper have a beat reporter and a columnist write stories about the same subject??? A complete waste of effort. Why do papers like the Chronicle publish stories we already know happened as if we didn’t know they happened? (Read most good bloggers and their take on timely events is already second-day, and this is on posts published hours after the event happened, not a full day). Why do they organize their newspaper the way newspapers were organized 100 years ago? Readers’ lives are different; why not their newspapers? The Chronicle can cover nothing well, and it now asks for $400 a year to prove it. Local free tabloids and an army of outstanding bloggers own the city conversation. The Chron doesn’t invest in state coverage, and we’ve already read, been tweeted or Facebooked, every important national or international story in its pages. The sports pages have some entertaining columnists, and former Mayor Willie Brown was a nice addition on Sunday, but the Web is filled with millions of columnists today. To my knowledge, no angry mob of readers stormed 5th and Mission with pitchforks and torches, demanding glossy pages. They’re leaving because the paper isn’t covering what they want the paper to cover (and by the way, they’re not covering it online either)–dysfunctional schools, crime, political corruption, government ineptitude. People will complain about media conglomerates killing newspapers, but the newsroom killed newspapers. They don’t live in the neighborhoods they cover, and they’re out of touch with readers. For a withering indictment of this effect, listen to Bob Cauthorn’s lecture to Berkeley J-students. He’s an old ink-stained wretch (who worked for the Chron) who’s moved on to found CityTools, which has been described as a social media framework for publishing news articles, lists and classified advertisements. Today’s newsroom is populated by editors beckoning you to climb aboard their stage coach for a fantastic ride with reupholstered seats. Meanwhile, the supersonic jets roar overhead. I really think this all goes back to corporate ownership of newspapers. Once corporations were able to buy large numbers of papers, that local aspect died, and numbers people who cared only about profitability took over. And everything went downhill from there. It’s really been a 20+ (maybe 30+) year decline. The Internet just cemented it. The Oregonian is a disaster too. I would pay for good local investigative journalism. Stop trying to repackage national news that I’ve already read and give me what nobody else in the world can.